Itzel Fong Gadea sent in a link to her gallery of Azuero Parakeet photos taken at Flores on June 20 (I reckon). As noted, some birds show dark irises, while some had pale irises. On Saturday, June 26, Delicia, Pedro & Darién Montañez visited the Velásquez farm at the appointed time (8:30 AM), but the parakeets were not immediately visible. We were forced to walk 25 meters from the house in order to locate a flock of about 30 birds, preening and frolicking in a nance tree. While waiting we had a half dozen Vaux's Swifts fly overhead. 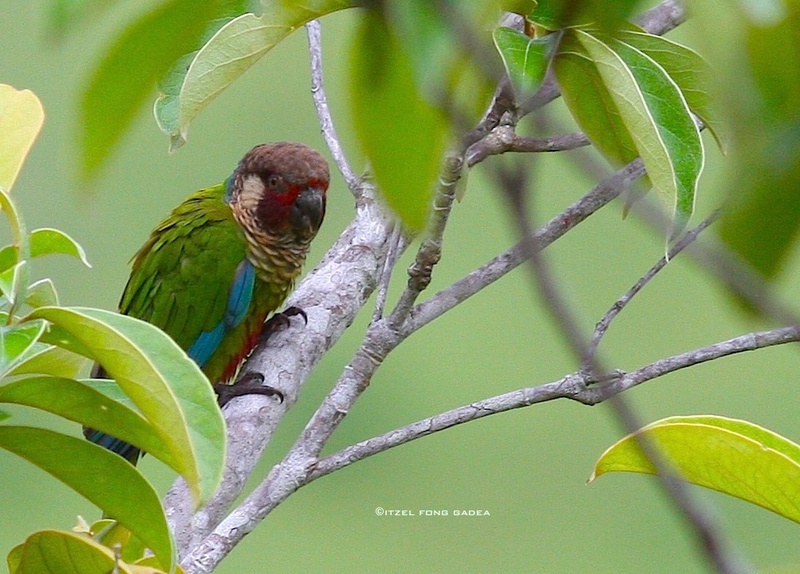 Juancho Velásquez, our host, says the parakeets are usually in the area from early June to early July, and favor fruiting figs and nances. This is by far the easiest way to see this Panama endemic, and you should go for it. To get to the Velásquez farm, drive past Atalaya towards Mariato. 100 km of a nice asphalt road later you will arrive at the town of Flores, on the outskirts of the buffer zone for Cerro Hoya National Park. 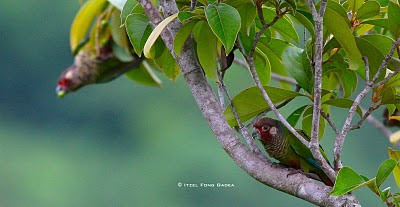 See map on page 182 of Where to Find Birds in Panama. From there, it's best to ask for directions; to get to the farm you'll be taking a dirt road (flat and firm, but with a muddy spot or two) to the right about 250m before you arrive at Flores. There's a $10 entry fee, which is the cheapest I've paid for an endemic lifer by far.